San Francisco tried in the mid-to-late 1940s to be a radio town and the most popular show in the series featured a hard boiled gun-toting private eye who took on the bad guys and talked tough. What made this detective unique? The Detective was a woman. The program was created by Marty Masters and the title role was played by his wife, Natalie. The detective show had been successful in San Francisco before, with Pat Novak for Hire having been a hit. Having a female private eye allowed Candy Matson to be more than a carbon copy of Novak. Candy was a fashion plate PI who charged top dollar to maintain her generous clothes budget and swanky apartment. She was assisted by her sidekick Rembrandt Watson who, in the pilot, was a drunk like Jocko Madigan. In subsequent episodes, he was more of an older eccentric man. Candy’s love interest was Lieutenant Ray Mallard of the Homicide squad, whose constant desire to watch Westerns and fear of committment annoyed Candy to no end. While there had been other female detectives on radio such as the soap operatic Kitty Keene and the gimmicky Phyl Cole, there had never been anyone quite like Candy as she often played as tough as the boys, as she came definitely from the hard boiled school of detection. Candy Matson was as San Franciscan as the Golden Gate bridge including local landmarks, local businesses, and local celebrities. The show became San Francisco’s most popular series. However, the show could not obtain a sponsor and the show shifted days and times at will. It was a West Coast production throughout its two years run. This is a show that is often taken too seriously and some commentators impose modern mores, viewpoints, and controversies on the stories. One commentator complained about the lack of Asian character in the show’s surviving 14 episodes (although the same commentator hadn’t checked the large number of Candy Matson scripts available at the Thousand Oaks Library.) This is perhaps because the idea of a female hard boiled eye is considered groundbreaking for the late 1940s and early 50s. In reality, neither the producers of the program or the fans thought of the show as a great step forward for women. Candy Matson never took itself too seriously. (Although, as Candy became more popular, the show did cast her in a little more serious light.) The adventures were told in a way that made them fun and winsome whether listening to the show in 1950 or 2011. Natalie Masters (1915-86): Natalie Masters was in show biz for many years before Candy Matson and enjoyed a rich television career, but Matson was clearly her claim to fame. 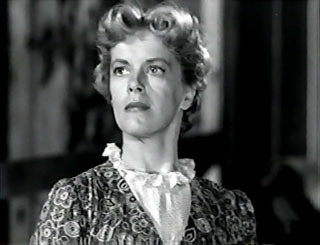 Many of her efforts were in collaboration with husband, Monty Masters in efforts such as The Mad Masters and were based in the San Francisco bay area. It wasn’t until she was 39 that Masters got her first break on television with San Francisco radio Alum. Jack Webb giving her a guest spot on Dragnet. Masters would spend the next 30 years appearing on programs such as Gunsmoke, The Lone Ranger, My Three Sons, and Hart to Hart. I organize OTR “broadcasts” at our retirement village. 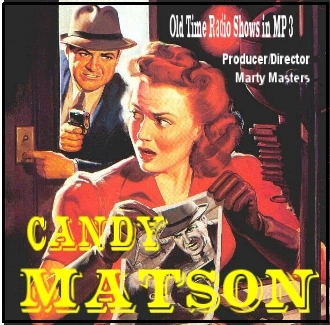 I came across Candy Matson but only in PDF format. Scripts I use are in a format that I can copy/paste to WordPad. CANDY MATSON, has to be the inspiration for the television show, “MOONLIGHTING”, with Bruce Willis and Cybil Sheperd! Too many similarities to be a coincidence. Please anyone with pdf or copy paste scripts on Candy. Where can I get them. Also, website from mikeplas website closed. Had so many fab scripts. Anyone no what happened?